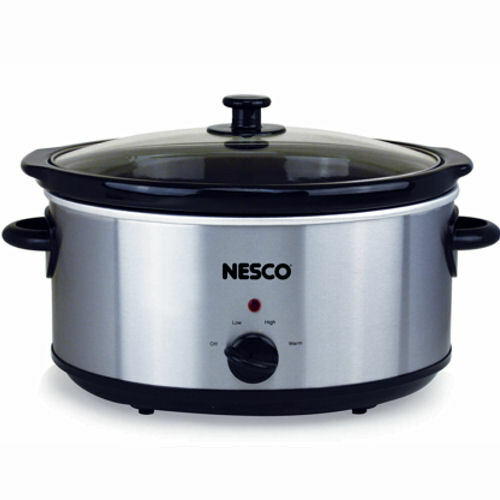 The Nesco SC-6-25 is a 6-Quart Oval Slow Cooker. This analog slow cooker can cook up delicious meals, appetizers, sauces and dips. The adjustable temperature control dial offers a keep warm setting to accommodate a busy lifestyle. The cooker features removable ceramic crock, clear tempered-glass lid and 3 heat settings i.e High, Low, and Auto. The handles on the crock make it convenient to lift and carry, even when wearing oven mitts. 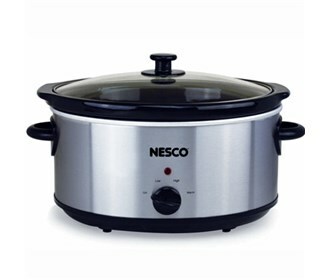 The Nesco Slow Cooker 6 Qt. Oval Analog Stainless Steel has many exciting features for users of all types. The Nesco Slow Cooker 6 Qt. Oval Analog Stainless Steel is sold as a Brand New Unopened Item.